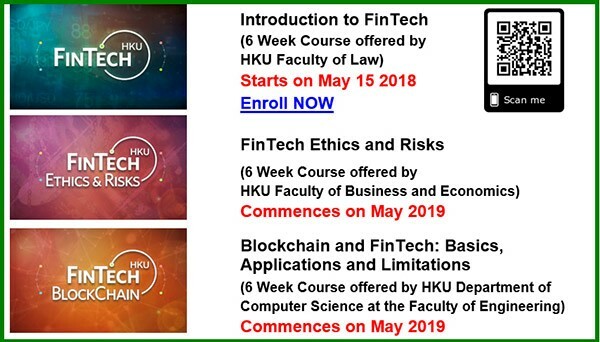 HKU presents Asia’s first interdisciplinary Professional Certificate Program in FinTech on edX platform starting on 15 May 2018. FinTech – short for Financial Technology – is transforming the world of finance, especially in Asia at a rate never seen before. It is essential that professionals working in finance, technology, regulation or FinTech and students studying related subjects are equipped with in-demand FinTech knowledge and skills in today’s world of finance. The FinTech Certificate Program compiles a series of three courses providing students with the tools to understand the interaction of finance and technology across the financial system as well as insight into the major technologies involved and the emerging business models and players in the industry. 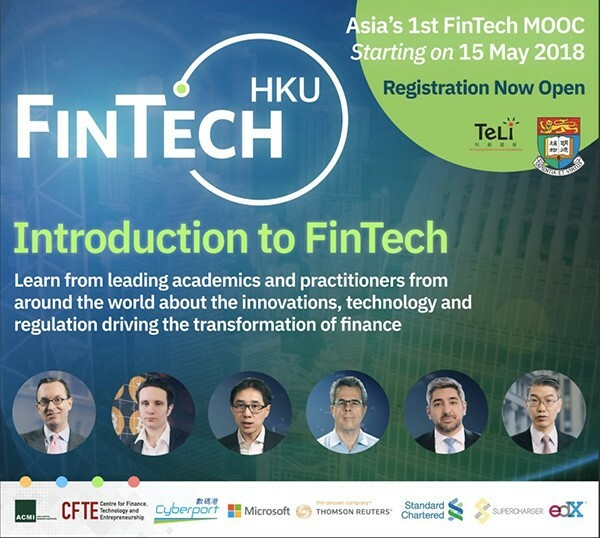 The first course Introduction to FinTech commences on May 15 and will be followed by two courses, FinTech Ethics and Risks and Blockchain and FinTech: Basics, Applications and Limitations, which will open over the coming year. Each course brings together leading experts in FinTech from a range of backgrounds, including professors, market professionals and entrepreneurs. Designed by leading academics from a range of disciplines with input from industry leaders including among others SuperCharger, the Centre for Finance, Technology and Entrepreneurship, Microsoft, PwC, the Asia Capital Markets Institute, the Standard Chartered Bank, Thompson Reuters, and other partners in financial services, FinTech startups and Techfins sectors. In each course, you will gain greater understanding of the key trends in finance, technology and regulation, to better prepare for not only the opportunities but also the risks and challenges, including to traditional financial institutions and business models and those working in them. Introduction to FinTech is a 6-week online course. In the course, you will learn about the major areas of FinTech including Money and Payment, Digital Finance and Alternative Finance. You will be introduced to major technological trends: Cryptocurrencies, Blockchain, AI and Big Data and see how they impact economies, markets, companies, and individuals. You will examine the role of Regulation and the implication of RegTech in the new world of data driven finance. Register at: https://www.edx.org/course/introduction-to-fintech (Registrations are free with a paying option for a course certificate.) More details: https://www.hkufintech.com. For enquiries, please contact at enquiry@teli.hku.hk.